Trelliclip foliage wire clips are the only clip you will ever need to secure your foliage wires to the poles. 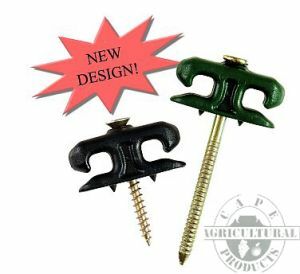 We have re-designed and updated the Trelliclip to make it easier to place your foliage wires while working in the vineyard. The new design is able to accomodate wire up to 3mm in diameter without having to be forced into the clip. Trelliclip can be used for securing Deltex foliage wires to poles. *** NOTE : When using Trelliclips with the Deltex polyester wire ensure that the clip is manufactured from NYLON for best performance. The green colour is uniform with the rest of the vineyard. * Other colours can be produced on request. Trelliclips can be supplied to countries outside of Southern Africa, either with or without nails.